Japan’s state-of-the-art Maglev train set a world speed record Tuesday during a test run near Mount Fuji, clocking more than 600 km/h. 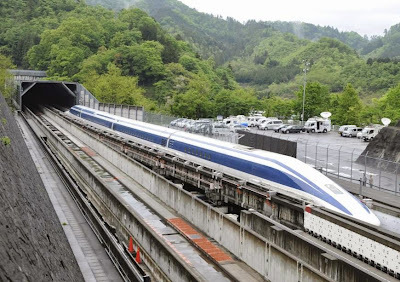 The seven-car Maglev — short for magnetic levitation — train, hit a top speed of 603 km/h (377 Mph), and managed nearly 11 seconds over 600 km/h Central Japan Railway (JR Tokai) said. The new record came less than a week after the train clocked 590 km/h, by breaking its own 2003 record of 581 km/h. The Maglev hovers 10 cm above the tracks and is propelled by electrically charged magnets. JR Tokai wants to have a train in service in 2027 plying the route between Tokyo and Nagoya, a distance of 286 km. The service, which will run at a top speed of 500 km/h, is expected to connect the two cities in only 40 minutes, less than half the time it takes by shinkansen. By 2045 Maglev trains are expected to link Tokyo and Osaka in just 67 minutes, slashing the journey time in half. However, construction costs for the dedicated lines are astronomical — estimated at nearly ¥11.9 trillion just for the stretch to Nagoya, with more than 80 percent of the route expected to go through costly tunnels.